This piece began with clippings from notes and phone call conversations with my four children, nieces and nephews. Somehow I wanted to preserve these lovely sentiments. And so my piece began and in its evolution, three faces appeared. 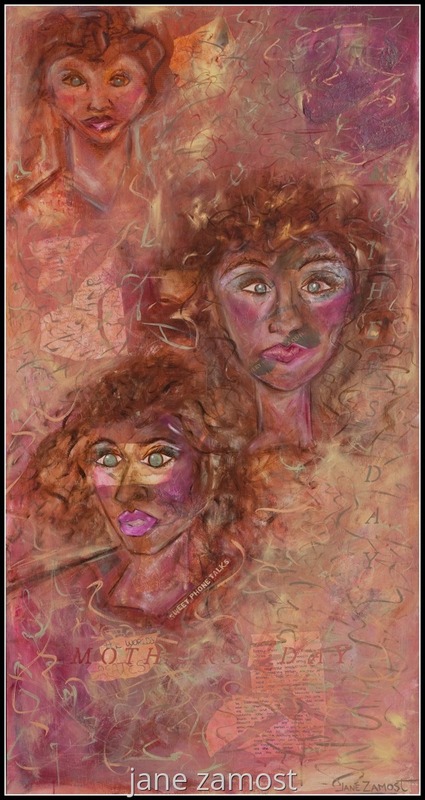 I realized post-painting that the faces were all mine - the innocent young woman who became a mother to one, then three and ultimately four children in total. As I continue on with the journey of motherhood, my eyes seem to become clearer. There's a sense of fearlessness in my middle age, viewing the observer straight on and then later, there is yet another face, that of the older mom hopefully a bit wiser and observing more than instructing, permitting my loved ones the ability to nurture themselves, discover their individual natures and forge their own paths. mixed media: oil, paper on board. digital reproductions starting at $125.